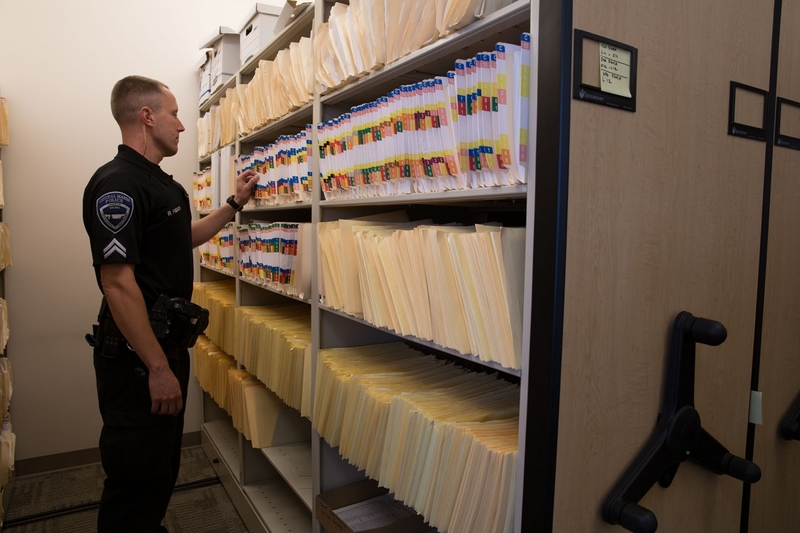 When funding was acquired for a new building in 2008, the chief called in the local Spacesaver affiliate to design storage solutions for evidence lockers, personal lockers, files, and sally port lockers. The chief had recently attended a walk-through of Sausalito’s new police department, which had been designed by Glass Architects, along with Systems and Space design consultant Catherine Belmont. The planning group wanted to make smart use of their available space, in large part because the new building would eventually house a further expanded police department comprising yet another municipality and a portion of a fourth. 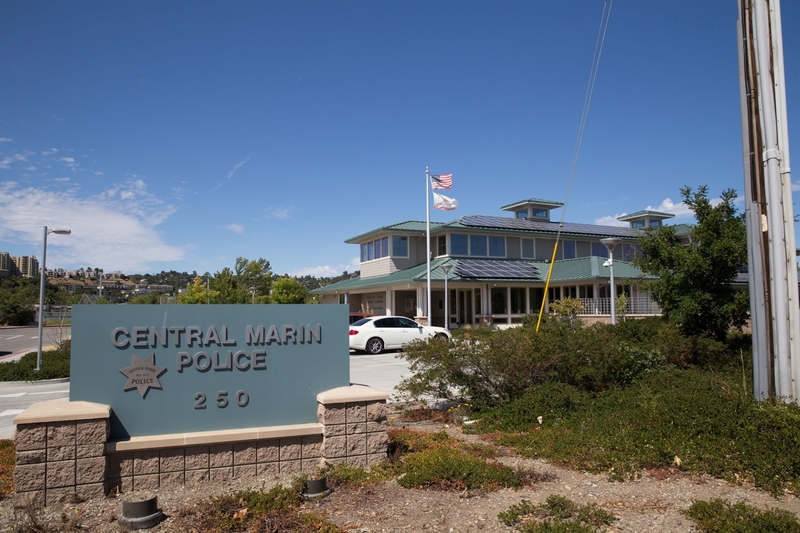 The new entity would be called the Central Marin Police Authority. 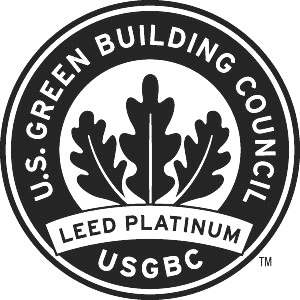 The recycled steel in Spacesaver products helped the new building achieve LEED platinum certification. The planning team acknowledged that the officers were working hard in tough conditions, dealing with unruly suspects and frequent uncertainty during hectic shifts. The planning team wanted to boost morale by investing in the officers’ comfort — and they saw the new building’s locker rooms as the best way to do that. They wanted the new locker rooms to be an oasis of order and safety for the officers. The defining feature of any locker room, of course, are the lockers themselves — so the planning team determined that the officers’ personal lockers should be a major focus of the project. They particularly liked the heavy-duty quality and versatility of Spacesaver’s FreeStyle® Personal Storage Lockers they had seen at the recently completed public safety building in Sausalito. Designing an ADA-compliant locker room involves more than just installing an accessible locker. The Spacesaver consultant knew how to ensure the locker room aisles would provide adequate turning space for wheelchair users, how to design and locate a bench for comfort and accessibility, and how to provide appropriate and accessible areas for instances when privacy would be required. The officers wanted to be able to charge electronic devices while they were off duty, so the devices would be fully charged and ready for use at the start of each shift. Handguns and other valuables can be stored inside a lockable compartment within the locker, which adds a layer of security. Sized just right for officers’ duty bags, drawers located on the bottom of each locker provide convenient access to the essentials that officers need to take out on patrol. Double doors allow for quick and easy access to locker contents, and vents allow for ample air circulation around garments and gear. After working hard to design efficient and attractive locker rooms, the planning team wanted to ensure that the rooms’ orderly appearance would be maintained over time. 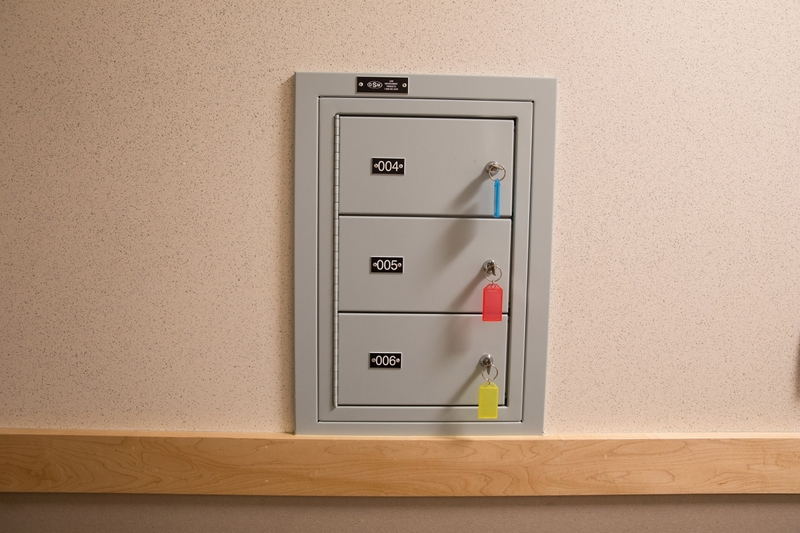 To prevent horizontal locker tops from being used for impromptu storage, the Spacesaver consultant specified that the locker tops should be finished with slanted steel toppers. Spacesaver’s FreeStyle lockers were the ideal solution. 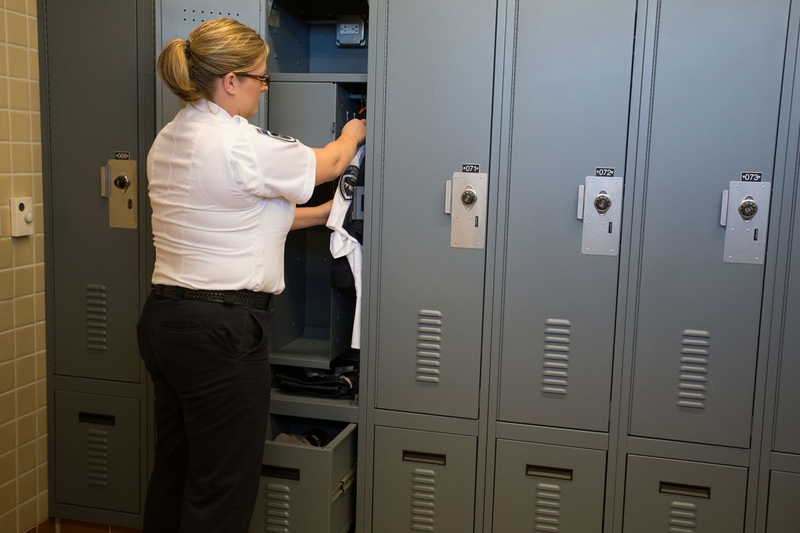 In addition to providing all the features on the officers’ list, the lockers offer a variety of configuration options to suit officers of different heights and preferences. Space-saving mobile shelving. A single facility now accommodates the combined paper files of several municipalities, so a compact mobile system was installed to save space. Shelving units are mounted on carriages that move along rails, which enables the units to be stored close together and eliminate wasted aisle space. Aisles are dynamically created at the point of need with mechanical-assist handles. 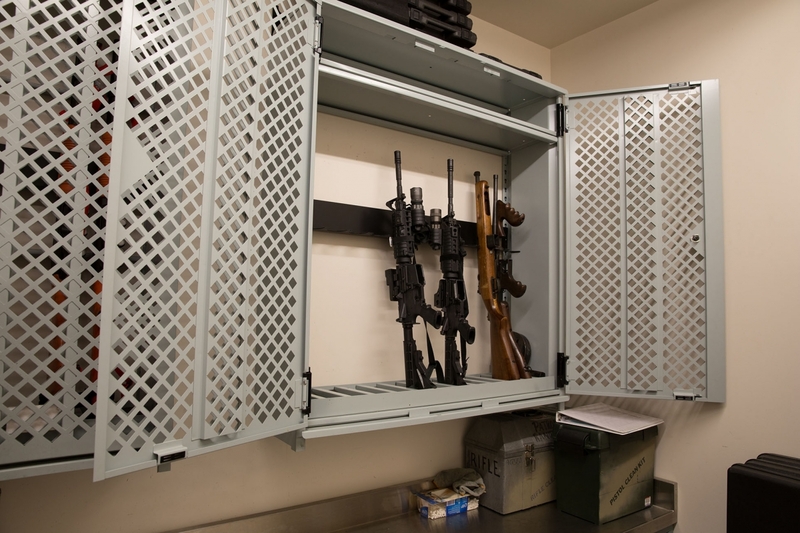 Universal™ Weapons Racks with perforated lockable doors store weapons in the SWAT room. Sally port lockers provide secure handgun storage during suspect processing. 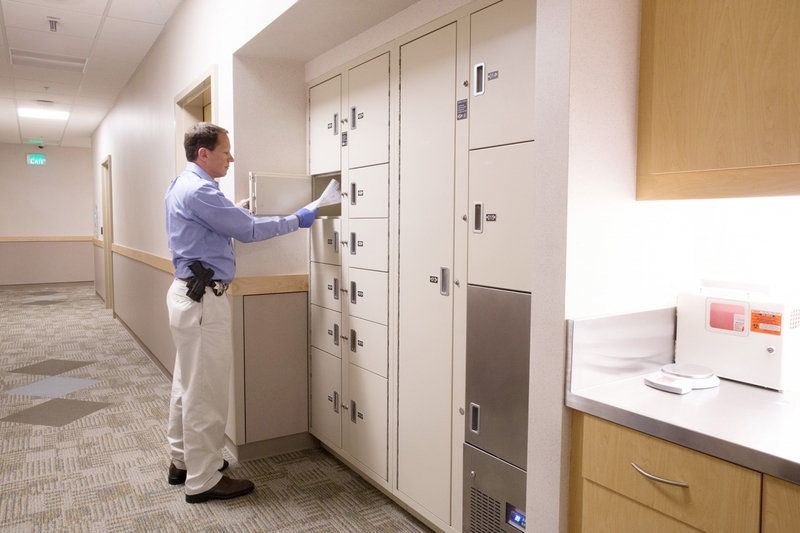 Evidence is secured in pass-through evidence lockers with doors in multiple sizes and a refrigerated compartment. Since Spacesaver products are engineered and manufactured in the USA, the local affiliate was able to specify made-to-order solutions that met accreditation requirements, the officers’ specifications, the allotted space, and the budget.